It has long been known that large impact craters and basins on the Moon and planets are often filled with volcanic deposits. The lunar maria, filling the large nearside impact basins such as Imbrium, Serenitatis and Tranquillitatis, are among the most familiar examples of this correlation (Wilhelms, 1987; Head and Wilson, 1992; Spudis 1993; Hiesinger et al., 2011) (Figure 1). This association has led to a long-standing series of investigations on the Moon to help establish the ages of the impact basins themselves and the onset, duration and volumes of subsequent mare basalt fill (for an overview and related references, see Head, September, 2004, LIP of the Month.). Figure 1: Color-coded map of the spatial distribution of model ages of lunar mare basalts superposed on a USGS shaded relief map. Ages shown are from Hiesinger et al. (2000, 2003, 2008, 2010, 2011). Model ages are in Gyr; bin size is 100 Myr. Map coverage is ~90°W to 120°E, ~75°S to 75°N. Furthermore, the fundamental question of whether the formation of impact craters and basins could induce the generation and emplacement of large volumes of volcanic deposits has been a long-standing debate for the Earth, as well. Some authors (for example, Jones et al., 2002) have argued that decompression melting following an impact into Earth's crust and lithosphere could lead to the development of Large Igneous Provinces. In contrast, others (for example, Ivanov and Melosh, 2003) have argued that impacts do not initiate volcanic eruptions. Disparate views result, of course, because of the large number of variables that are involved in the impact cratering process. Among these variables are: 1) variations in target composition (e.g., continental versus oceanic crust), 2) differences in crustal and lithospheric thickness as a function of space and time, 3) the size of the impacted body and the resulting pressure gradient, 4) the size of the impactor, its composition and angle of incidence, 5) the amount of impact melt produced and the ability to distinguish deposits from this part of the cratering process from impact-induced volcanism. Owing to these complexities, and variations of these factors throughout the history of lunar and planetary evolution, it is unlikely that a single sweeping statement can be made concerning whether or not impact-induced volcanism is possible. Although broad predictions are possible, each example should be approached and assessed on a case-by-case basis. As a step in this direction, we have recently completed a case-study of the distribution, characteristics, ages and volumes of mare basalt volcanic deposits associated with the 930 km-diameter Orientale impact basin (Figure 2), the youngest and most well-preserved large impact basin on the Moon (Whitten et al., 2011). Orientale formed at the end of the period of heavy impact bombardment (e.g., Head et al., 2010). By this time the anorthositic crust had formed (Joliff et al., 2006) and the global lithosphere had thickened and become more homogeneous (Solomon and Head, 1980; Wieczorek et al., 2006). The Orientale event involved transfer of the impact-related kinetic energy to the substrate to cause deformation, heating, melting of the substrate, excavation of huge volumes of ejecta, its lateral redistribution and emplacement, the collapse of the transient cavity, the uplift of geotherms, and the subsequent longer-term thermal re-equilibration of the emplaced heat and uplifted geotherms (e.g., Bratt et al., 1985a,b). Is there evidence of impact-induced mare volcanism (Figure 2) associated with the Orientale basin event? 2. Models of Mare Basalt Genesis. Initially, basic models for the formation of mare basalts were postulated that involved internal radiogenic heat sources and sequential partial melting of a layered mantle (e.g., Solomon, 1975). Subsequent petrological evidence suggested a wide range of source depths for mare basalts and the documentation of increasing complexities in the ages and petrogenesis of mare basalts led to the proposal of several major new ideas for their generation (see summary in Shearer et al., 2006). End-member models for the generation, ascent and eruption of mare basalts (as observed in the distribution of mare deposits) can be classified into five types (see Whitten et al., 2011 for a detailed description of each): 1) The nearside/farside asymmetry in the distribution of mare basalts is due to crustal thickness differences; 2) Impact basin pressure-release melting and associated secondary convection can help explain the observed distribution of mare basalts; 3) An enhanced lower crustal radioactive-element-rich layer helps explain the generation, distribution and mode of emplacement of mare basalts in some areas of the Moon; 4) The large-scale overturn of an initial unstable stratification causes the generation of mare basalts; and 5) Mare basalt emplacement is independent of basin formation, but the nature and location of source regions and emplacement styles are related to global thermal evolution and impact basin evolution. The young and well-preserved Orientale basin (Figure 2) offers an excellent opportunity to assess the second end-member candidate (Model 2: Impact pressure-release melting). Pressure-release melting is known to be an important mechanism for basalt generation in general, but the lunar pressure gradient, combined with the composition of the crust and the apparent depth of origin of mare basalts, has led to this mechanism generally not being favored for mare basalt formation. Elkins-Tanton et al. (2004), on the other hand, reassessed the magmatic effects of large basin formation, and introduced a two-stage model for melt creation beneath lunar basins triggered by basin formation itself. In the initial stage, crater excavation depressurizes and uplifts underlying mantle material so that it melts in-situ instantaneously, forming large quantities of melt below the basin (in addition to impact melt in the cavity). This model thus predicts huge quantities of in situ pressure-release melt (98-100% of the melt created) produced instantaneously and available to be extruded into the impact basin as lunar mare basalts. In the second stage, the cratered region rises isostatically, warping isotherms upward and inducing convection, at which time adiabatic melting can occur. This second stage is miniscule in terms of melt produced (1-2% of the total) but can last for a longer period of time, up to ~350 Ma. In the Elkins-Tanton et al. (2004) model, mafic mantle melts can be generated from depths of 150-560 km, depending on mantle potential temperature. Assuming that 10% of the melt generated erupts, Elkins-Tanton et al. (2004) find that the volumes of magma reported for basins are similar to their predictions (their Figure 5). Elkins-Tanton et al. (2004) also model the origin and emplacement of high-alumina, high-TiO2, KREEP-rich and picritic magmas, and predict an order of eruption, with the most primitive, lowest titanium magmas last. In a more recent treatment of impact-induced convection, Ghods and Arkani-Hamed (2007) used a suite of numerical models to show that this mechanism might be able to account for the formation of mare basalts, the range of depths of their source regions, the observed delay between impact basin formation and initiation of basaltic volcanism, and the long duration of emplacement of mare basalts. These models treat basins of different sizes (e.g., ranging from Orientale, through Imbrium, to South Pole-Aitken), make different predictions about the record of mare basalt emplacement for each, and can be readily tested against the geological record of mare basalt volcanism. In summary, models for pressure-release melting predict initially large volumes of mare basalts in the basin center, followed by smaller amounts emplaced over several hundred million years. 3. Tests of the Models. Although the five models treat different aspects of the origin, evolution and emplacement of mare basalts, each makes different predictions and can be tested with the further characterization of mare basalts in the Orientale basin. Key tests thus involve the timing, duration, volumes, styles and the comparison of the record in different sized basins. To test these hypotheses in general, and that of the basin-induced volcanic activity in particular, Whitten et al. (2011) undertook the following assessments: 1) Analysis of the initiation of mare basalt volcanism in time and space; 2) Analysis of the termination of mare volcanism in time and space (where are the latest mare basalts, what is their age, what is their mode of emplacement? ); 3) How do the Orientale mare deposits compare to the global distribution of mare basalts as a function of time? ; 4) How does the mineralogy of the Orientale mare deposits compare to the global distribution of mare basalt types? ; 5) How do eruption styles compare to the global distribution of mare basalt vent types and implied eruption conditions? 6) How do the individual and total volumes of Orientale mare basalts help constrain the total volume of mantle melting that has occurred (using estimates of extrusion to intrusion ratios, and depths of origin, to provide an order of magnitude assessment of the total melting that occurred, updating earlier estimates)? 7) How do the model ages and model age ranges of Orientale mare basalt emplacement relate to the general thermal evolution of the Moon and to the loading and subsidence observed in other basins (e.g., Solomon and Head, 1979; 1980)? 8) Is there any evidence in the Orientale region for pre-Orientale mare deposits whose presence might indicate that volcanism had started before the Orientale basin formation (Greeley et al., 1993; Antonenko et al., 1995: Mustard and Head, 1996)? Thus, the results of the Whitten et al. (2011) analyses help to test the basin-induced volcanic activity hypotheses for the Orientale impact basin. 4. Distribution of Orientale Mare Basalts In Space and Time. On the basis of previous analyses and the Whitten et al. (2011) assessment, the formation of the Orientale basin is dated to the beginning of the Upper Imbrian period at ~3.68 Ga. 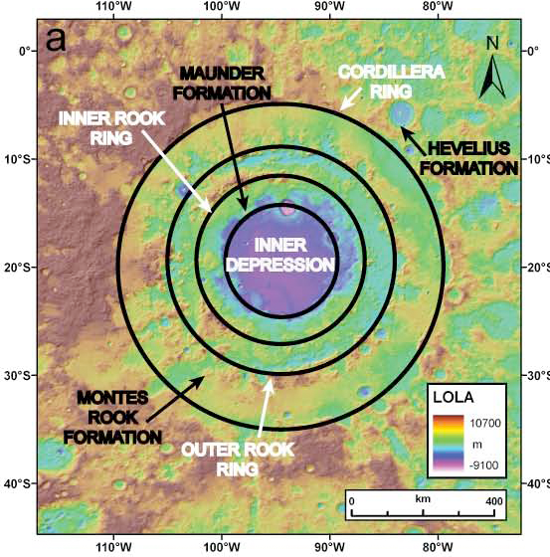 The 930 km-diameter basin interior covers an area of ~700,000 km2, and because the basin interior has not been completely filled with mare deposits, all three of its main mountain rings are still visible (Inner Rook, Outer Rook, Cordillera) (Figure 2). The preservation of the ring topography clearly separates all of the Orientale mare deposits (Mare Orientale, Lacus Veris, Lacus Autumni, and their constituent mare patches; Figure 3) and allows further investigation of their ages and modes of emplacement. Whitten et al. (2011) and earlier studies (Greeley et al., 1993; Antonenko et al., 1995: Mustard and Head, 1996) found that mare basalt emplacement had begun in the Orientale basin target region prior to the impact event. Figure 3: Distribution of mare deposits (gray) in the Orientale basin. Details of individual numbered pond and deposits can be found in Whitten et al. (2011). Post-Orientale basin event volcanism began in the center of the basin at ~3.58 Ga, approximately a hundred million years after basin formation (~3.68 Ga). Mare Orientale, the central deposit (Figure 3), erupted in a flood basalt mode. 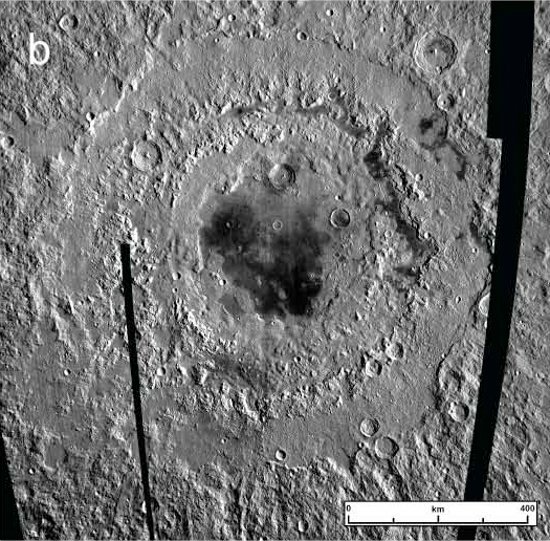 Study of embayment of impact craters formed after Orientale, but prior to mare flooding, and assessment of the spectral characteristics and depth of sampling of post-mare emplacement craters, provide an indication of ~ 200 m for the average thickness of Mare Orientale (Whitten et al., 2011). On the basis of these data, Mare Orientale has an area of ~52,700 km2 and a volume of ~10,400 km3, much less in areal extent and volume than the Columbia River Basalts (Reidel, 2005; Jay and Widdowson, 2008). Mare Orientale was followed closely by later, less voluminous pulses of volcanism that produced the mare ponds in Lacus Veris and lastly those in Lacus Autumni (Figure 3). Estimated flow unit volumes range from 30 to 7,700 km3, averaging between 590 and 940 km3. The youngest of these mare deposits occur along the edge of the basin in Lacus Autumni. Crater count model ages for these deposits range from 3.47 to 1.66 Ga. A few of the ponds in Lacus Veris have ages within this range as well. The abundance of sinuous channels and rilles in these two laci indicates a basaltic plains style volcanism, with both point sources and fissure eruptions. Mare eruption locations are focused along the margins of the different basin rings, mostly in the form of vents and sinuous rilles. The sequence and timing of mare basalt deposits suggest that regional basin-related stresses exerted control on their distribution. The model age distribution of Orientale mare basalts, between ~3.58 and ~1.66 Ga, shows that they span nearly the entire range of nearside model ages (Figure 4). Even the latest Orientale basalt patches are as young as some of the youngest basalt deposits on the lunar nearside. The majority of Orientale mare ponds were deposited during the highest frequency of eruptions on the lunar nearside, centered around 3.5 Ga (Hiesinger et al., 2011) (Figure 4). 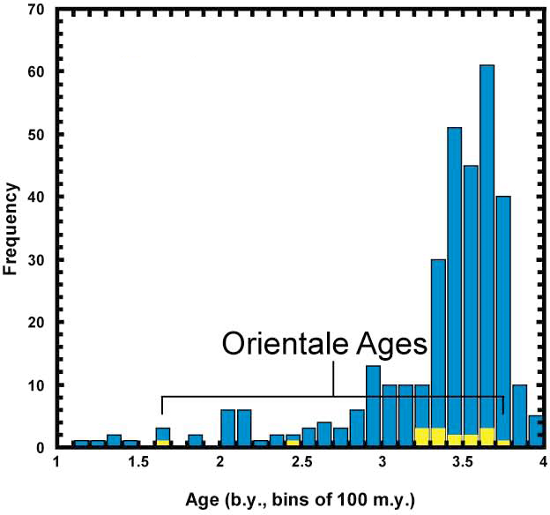 Figure 4: Histogram of the temporal distribution of model ages for mare basalts in nearside and farside basins and craters (blue) (modified from Hiesinger et al., 2011), compared to the Orientale basin (yellow) (Whitten et al., 2011). 5. Relation to Models for Formation and Evolution of Mare Basalts. Analyzing the various characteristics (e.g., ages, area, volumes, elevations, spectral compositions and associated volcanic features) of Orientale basin mare basalts (Whitten et al., 2011) has thus assisted in further understanding the relationship between the formation of lunar impact basins and the onset of mare volcanism. In the Elkins-Tanton et al. (2004) model, basin-forming impacts induce pressure-release melting and associated secondary convection to explain the distribution of lunar mare basalts. The first stage predicts large volumes of mare basalts in the center of the basin (98-100% of the total melt), followed by smaller amounts of basalts (1-2% of the total melt) emplaced over a much longer period of time. Calculated volumes of mare basalts in Orientale basin suggest Mare Orientale (Figure 3) contains ~94% of the total mare by volume and the rest (~6%) resides in Lacus Veris and Autumni. Despite this general agreement in the locations and their relative volumes of mare, the total volumes of pressure-release volcanism predicted by the models are much higher than observed in Mare Orientale. Furthermore, dating of the basaltic surfaces in Orientale has shown that this process of pressure-release melting is not consistent with the predicted timing. Central Mare Orientale was not emplaced until ~100 Ma after the formation of the basin. This time gap shows that the extrusion of Mare Orientale was not instantaneous and therefore, was not likely to be the direct product of impact-induced pressure-release melting. In addition, mare volcanism had already commenced in the Orientale region prior to the impact event. Model age dates thus confirm that although the earliest post-impact volcanism did occur in the center of the basin, it was very likely to be independent of the basin-forming impact, as evidenced by the time lag between basin formation and emplacement of Mare Orientale. The younger deposits in Lacus Veris and Lacus Autumni show a weak positive correlation between age and increasing distance from the center of the basin; deposits tend to be younger as they occur further from the basin center. Could these be due to later stages of impact-basin-induced convection, as predicted by the models? Although this possibility cannot be unequivocally ruled out, two observations argue against it being the major factor in the formation of these basalts in Orientale: 1) The mare ponds of Lacus Veris and Autumni are concentrated in the eastern and northeastern parts of the basin, trends that are more correlated with regional variations in crustal and thermal structure, than with impact-induced convection. 2) The range of ages of mare basalts in Orientale indicate that Orientale mare basalts were erupting onto the surface over a significant time period (~1.9 Ga) and that this mirrors the range of ages of mare basalts for the Moon as a whole (Hiesinger et al., 2011) (Figures 1, 4). These two observations imply that global controls on Orientale mare volcanism were more important than local, basin-related controls. The complexities and variations associated with the character of both the impacting projectile and the substrate throughout the history of lunar and planetary evolution for each planetary body means that it is unlikely that a single sweeping conclusion can be made concerning the occurrence of impact-induced volcanism. In this sample case-study, we have shown that model predictions for impact-basin-induced volcanism are not observed in the distribution and ages of mare basalt deposits in the 930-km-diameter lunar Orientale basin. Similar case studies for larger basins formed earlier in lunar history, such as the South Pole-Aitken basin (Pieters et al, 2001), may find different results due to the scale of the basin and the thinner lithosphere characterizing the Moon during the earliest period of lunar history. General References and References Cited in Text. Antonenko, I., J. W. Head, J. F. Mustard and B. R. Hawke, Criteria for the detection of lunar cryptomaria, Earth Moon Planets, 69, 141-172, 1995. Arkani-Hamed, J. and A. Pentecost, On the source region of the lunar mare basalt, J. Geophys. Res., 106, 14,691-14,700, 2001. Bratt, S. R., S. C. Solomon and J. W. Head, The evolution of impact basins; cooling, subsidence, and thermal stress, J. Geophys. Res., 90, 12415-12433, 1985a. Bratt, S. R., S. C. Solomon, J. W. Head and C. H. Thurber, The deep structure of lunar basins; implications for basin formation and modification, J. Geophys. Res., 90, 3049-3064, 1985b. Bussey, D. B. J. and P. D. Spudis, Compositional analysis of the Orientale basin using full resolution Clementine data: Some preliminary results, Geophys. Res. Lett., 24, 445-448, 1997. Bussey, D. B. J. and P. D. Spudis, Compositional studies of the Orientale, Humorum, Nectaris, and Crisium lunar basins, J. Geophys. Res., 105, 4235-5244, 2000. Elkins-Tanton, L. T. and B. H. Hager, Giant meteoroid impacts can cause volcanism, Earth Planet. Sci. Lett., 239, 219-232, 2005. Elkins-Tanton, L. T., B. H. Hager and T. L. Grove, Magmatic effects of the lunar late heavy bombardment, Earth Planet. Sci. Lett., 222, 17-27, 2004. Ghods, A. and J. Arkani-Hamed, Impact-induced convection as the main mechanism for formation of lunar mare basalts, J. Geophys. Res., 112, E03005, 2007. Greeley, R., Modes of Emplacement of Basalt Terrains and an Analysis of Mare Volcanism in the Orientale Basin, Proc. Lunar Planet. Sci. Conf., 7th, 2747-2759, 1976. Greeley, R., S. D. Kadel, D. A. Williams, L. R. Gaddis, J. W. Head, A. S. McEwen, S. L. Murchie, E. Nagel, G. Neukum, C. M. Pieters, J. M. Sunshine, R. Wagner and M. J. S. Belton, Galileo imaging observations of lunar maria and related deposits, J. Geophys. Res., 98, 17183-17205, 1993. Head, J. W., Orientale multi-ringed basin interior and implications for the petrogenesis of lunar highland samples, The Moon, 11, 327-356, 1974. Head, J. W., Lunar volcanism in space and time, Rev. Geophys., 14, 265-300, 1976. Head, J. W., Lava flooding of ancient planetary crusts: geometry, thickness, and volumes of flooded lunar impact basins, The Moon and the Planets, 26, 61-88, 1982. Head, J.W. and L. Wilson, Lunar mare volcanism: Stratigraphy, eruption conditions, and the evolution of secondary crusts, Geochim. Cosmochim. Acta, 55, 2155-2175, 1992. Head, J. W., S. Murchie, J. F. Mustard, C. M. Pieters, G. Neukum, A. McEwen, R. Greeley, E. Nagel and M. J. S. Belton, Lunar impact basins: New data for the western limb and far side (Orientale and South Pole-Aitken basins) from the first Galileo flyby, J. Geophys. Res., 98, 17,149-17,181, 1993. Head, J. W., L. Wilson and C. M. Weitz, Dark ring in southwestern Orientale Basin: Origin as a single pyroclastic eruption, J. Geophys. Res., 107 (E1), 10.1029/2000JE001438, 2002. Head, J. W., C. I. Fassett, S. J. Kadish, D. E. Smith, M. T. Zuber, G. A. Neumann, and E. Mazarico, Global distribution of large lunar craters: Implications for resurfacing and impactor populations, Science, 329, 1504-1507, 2010. Hess, P. C. and E. M. Parmentier, A model for the thermal and chemical evolution of the Moon’s interior: Implications for the onset of mare volcanism, Earth Planet. Sci. Lett., 134, 501-514, 1995. Hiesinger, H. and J. W. Head, New views of lunar geoscience: An introduction and overview, Rev. Mineral. Geochem., 60, 1-81, 2006. Hiesinger, H., R. Jaumann, G. Neukum and J. W. Head, Ages of mare basalts on the lunar nearside, J. Geophys. Res., 105 (E12), 29,239-29,275, 2000. Hiesinger, H., J. W. Head, U. Wolf, R. Jaumann and G. Neukum, Lunar mare basalt flow units: Thickness determined from crater size-frequency distributions, GRL, 29, L014847, 2002. Hiesinger, H., J.W. Head, U. Wolf, R. Jaumann and G. Neukum, Ages of Lunar Mare Basalts in Mare Frigoris and Other Nearside Maria, Lunar Planet. Sci. Conf. [CD-ROM], 34th, abstract 1257, 2003. Hiesinger, H., J. W. Head, U. Wolf, G. Neukum and R. Jaumann, Ages of mare basalts on the lunar farside: A synthesis, Lunar Planet. Sci. Conf. [CD-ROM], 39th, abstract 1269, 2008. Hiesinger, H., J. W. Head, U. Wolf, R. Jaumann, and G. Neukum, Ages and stratigraphy of lunar mare basalts in Mare Frigoris and other nearside maria based on crater size-frequency distribution measurements, J. Geophys. Res., 115, E03003, doi:10.1029/2009JE003380, 2010. Hiesinger, H., J. W. Head, U. Wolf, R. Jaumann and G. Neukum, Ages and stratigraphy of lunar mare basalts: A synthesis, Geol. Society of America – Special Paper, in press, 2011. Ivanov, B. A. and H. J. Melosh, Impacts do not initiate volcanic eruptions: Eruptions close to the crater, Geology, 31, 869-872, 2003. Jay, A. E. and M. Widdowson, Stratigraphy, structure and volcanology of the SE Deccan continental flood basalt province: implications for eruptive extent and volumes, J. Geo. Soci. London, 165, 177-188, 2008. Jollif, B. L., M. A. Wieczorek, C. K. Shearer, and C. R. Neal, editors, New Views of the Moon, Mineralogical Society of America, Chantilly, VA, 2006. Jones, A. P., G. D. Price, N. J. Price, P. S. DeCarli, and R. A. Clegg, Impact induced melting and the development of large igneous provinces, Earth Planet. Sci. Lett., 202, 551-561, 2002. Melosh, H. J., Impact Cratering: A Geologic Process, 245 pp., Oxford University Press, Oxford, United Kingdom, 1989. Moore, H. J., C. A. Hodges and D. H. Scott, Multiringed Basins: illustrated by Orientale and associated features, Proc. Lunar Planet. Sci. Conf., 5th, 71-100, 1974. Mustard, J. F. and J. W. Head, Buried stratigraphic relationships along the southwestern shores of Oceanus Procellarum: Implications for early lunar volcanism, J. Geophys. Res., 101, 18,913- 18,925, 1996. Neukum, G., B. A. Ivanov and W. K. Hartmann, Cratering records in the inner solar system in relation to the lunar reference system, Space Science Reviews, 96, 55-86, 2001. Neumann, G. A., M. T. Zuber, D. E. Smith and F. G. Lemoine, The lunar crust: Global structure and signature of major basins, J. Geophys. Res., 101, 16,841-16,863, 1996. Pieters, C. M., J. Sunshine, E. M. Fisher, S. L. Murchie, M. Belton, A. McEwan, L. Gaddis, R. Greeley, G. Neukum, R. Jaumann and H. Hoffmann, Crustal diversity of the Moon: Compositional analyses of Galileo solid state imaging data, J. Geophys. Res., 98, 17127-17148, 1993. Pieters, C. M., J. W. Head, L. Gaddis, B. Jolliff and M. Duke, Rock types of South Pole-Aitken basin and extent of basaltic volcanism, J. Geophys. Res., 106 (E11), 28,001-28,022, 2001. Reidel, S. P., A lava flow without a source: The Cohassett flow and its compositional components, Sentinel Bluffs member, Columbia River basalt group, J. Geo., 113, 1-21, 2005. Scott, D. H., J. F. McCauley and M. N. West, Geologic map of the west side of the Moon, U. S. Geol. Surv. Map, I-1034, 1977. Shearer, C. K., P. C. Hess, M. A. Wieczorek, M. E. Pritchard, E. M. Parmentier, L. E. Borg, J. Longhi, L.T. Elkins-Tanton, C. R. Neal, I. Antonenko, R. M. Canup, A. N. Halliday, T. L. Grove, B. H. Hager, D-C. Lee and Uwe Wichert, Thermal and Magmatic Evolution of the Moon, Rev. Mineral. Geochem., 60, 365-518, 2006. 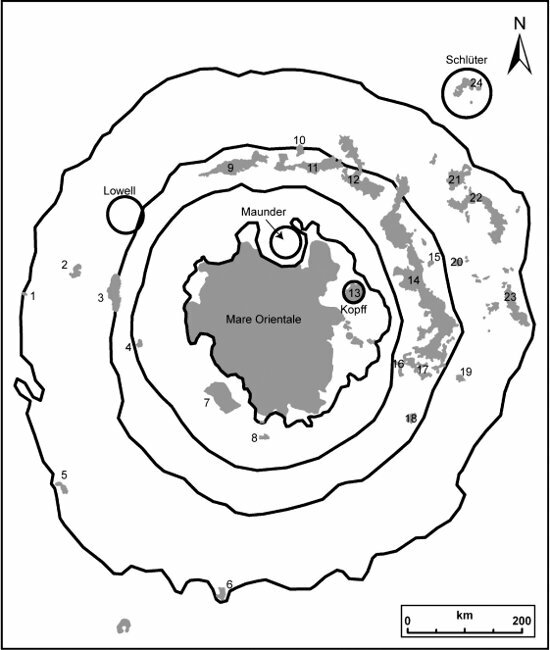 Solomon, S. C., Mare volcanism and lunar crustal structure, Proc. Lunar Planet. Sci. Conf., 6th, 1021-1042, 1975. Solomon, S. C. and J. W. Head, Vertical movement in mare basins: Relation to mare emplacement, basin tectonics, and lunar thermal history, J. Geophys. Res., 84, 1667-1682, 1979. Solomon, S. C. and J. W. Head, Lunar mascon basins: lava filling, tectonics, and evolution of the lithosphere, Rev. Geophys. Space Phys., 18, 107-141, 1980. Spudis, P. D., The Geology of Multi-ring Impact Basins, Cambridge Planetary Science Series, 263 pp., Cambridge Univ. Press; Cambridge, United Kingdom, 1993. Spudis, P. D., B. R. Hawke and P. Lucey, Composition of Orientale basin deposits and implications for the lunar basin-forming process, Proc. Lunary Planet. Sci. Conf., 15th, Part 1, J. Geophys. Res., 89, suppl., C197-C210, 1984. Stöffler, D., G. Ryder, B. A. Ivanov, N. A. Artemieva, M. J. Cintala and R. A. F. Grieve, Cratering history and lunar chronology, Rev. Mineral. Geochem., 60, 519-596, 2006. Wieczorek, M. A., B. L. Jolliff, A. Khan, M. E. Pritchard, B. P. Weiss, J. G. Williams, L. L. Hood, K. Righter, C. R. Neal, C. K. Shearer, I. S. McCallum, S. Tompkins, B. R. Hawke, C. Peterson, J. J. Gillis and B. Bussey, The Constitution and Structure of the Lunar Interior, Rev. Mineral. Geochem., 60, 221-364, 2006. Wilhelms, D., The geologic history of the Moon, U.S. Geol. Surv., Prof. Paper 1348, 1987. Wilson, L. and J. W. Head, Ascent and eruption of basaltic magma on the Earth and Moon, J. Geophys. Res., 86, 2971-3001, 1981. Yingst, R. A. and J. W. Head, Volumes of lunar lava ponds in South Pole-Aitken and Orientale Basins: Implications for eruption conditions, transport mechanisms and magma source regions, J. Geophys. Res., 102, 10,909-10,931, 1997. Yingst, R. A. and J. W. Head, Geology of mare deposits in South Pole-Aitken Basin as seen by Clementine UVVIS data, J. Geophys. Res., 104, 18,957-18,979, 1999. 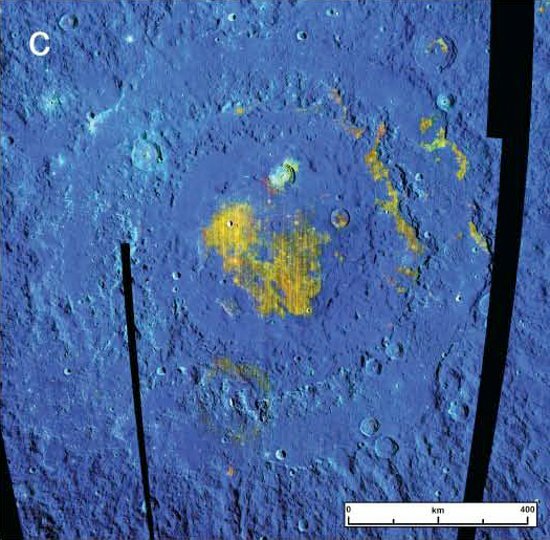 Whitten, J., J. W. Head, M. Staid, C. M. Pieters, J. F. Mustard, R. Clark, Jeff Nettles, Larry Taylor, and R. L. Klima, Lunar mare deposits associated with the Orientale impact basin: New insights into mineralogy, history, mode of emplacement, and relation to Orientale basin evolution from Moon Mineralogy Mapper (M3) data from Chandrayaan-1, J. Geophys. Res. Planets, in press, 2011.